DolFab Metal Fabricators recently completed extensive repairs on the hull of Ajao, a beautiful 80’ Baglietto yacht. Ajao suffered from major corrosion to its hull due to an issue with the external exhaust system. The yacht almost sank due to this corrosion and demanded an array of extensive refinements. Dolfab was hired to perform repairs on the hull, fuel tanks, and bow. The process of repairing the Ajao was quite an undertaking. The scope of the project involved emptying the fuel tanks and removing corroded sections there, removing large sections of the yacht’s hull, replacing all the missing sections with customized new panels which were then welded into place, and finally pressure-testing the structure to ensure its seaworthiness. The Dolfab crew found other issues on the yacht. The damaged hull created too much pressure and had caused the teak flooring on the bow to burst open. The team repaired and reinforced the structure of the bow, going through the forward bulkheads to ensure the yacht is seaworthy after all repairs are finished. Ajao passed the pressure testing procedures and was scheduled for fiberglass repair and paint before it was relaunched earlier this month. Ajao has now been restored to its former glory! 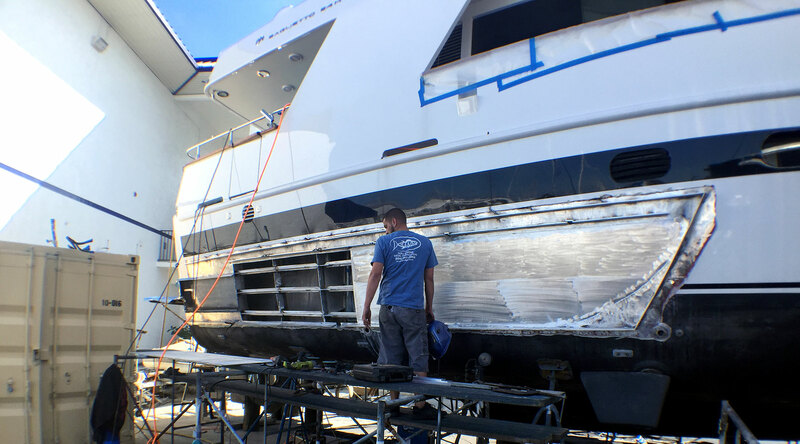 DolFab has been working since 1984 in the commercial and private marine market to deliver custom metal fabrication and yacht finishing solutions in the Fort Lauderdale area.